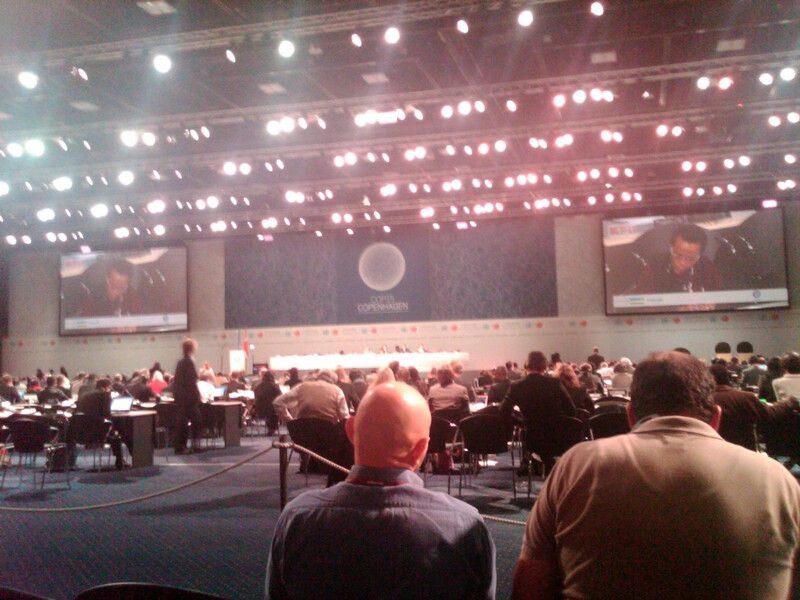 After a somewhat sleepy day yesterday, the discussions at COP15 are picking up in passion and intensity. In this morning’s Plenary I (a meeting of the Subsidiary Body for Implementation or SBI), one of the main topics was the status of the Global Environment Facility, i.e., one of the most important mechanisms for financing climate-related projects in the developing world. A representative from the GEF (pronounced “Jeff”), which is implemented by the World Bank, recited a litany of successes, touted the billions of dollars spent to date on climate-related projects, and identified the many tons of CO2 emissions reduced or avoided. He also acknowledged the need for reforms in the GEF and outlined a number of key reforms that are already underway. In response, delegates from numerous developing countries commended the managers of the GEF for their efforts at reform. However, many of these delegates, particularly those from the least developed countries (known as “LDCs”) such as Sudan, Nicaragua, Benin, Iraq, Antiga & Barbuda, passionately and firmly called for more fundamental and extensive reforms. Three themes were repeated often. First, the LDCs emphasized the critical importance of reforming or eliminating the “co-financing” requirement. In their view, this requirement serves as an insurmountable obstacle to obtaining loans for urgently needed climate-related projects. According to the delegate from Sudan, the co-financing requirement essentially tells developing countries that, in order to get a loan for $100 from GEF, they must first get a loan for $300 from somewhere else. She explained that this doesn’t make any sense because, if they could obtain the $300, they wouldn’t need the $100 loan. As a result, loans for climate-related projects are disproportionately directed to the wealthier subset of developing nations rather than the LDCs who need them most urgently. A second theme from the LDCs was that far more funding was needed for “adaptation” projects (i.e., projects designed to help vulnerable nations address the catastrophic effects of climate change). They critiqued the GEF for focusing almost exclusively on “mitigation” projects (i.e., projects designed to reduce or prevent emissions of greenhouse gases). From the LDC perspective, their contribution to the climate change problem is negligible, but they are facing the most imminent and serious climate effects right now. For instance, the delegate from Iraq called attention to widespread drought, water shortages, desertification, and sandstorm problems in his region. The LDCs believe the purpose of the financing mechanism is to address adaptation problems just as much as it is to promote mitigation efforts and that the upcoming reform efforts should take this into account. The LDCs’ third criticism is that the GEF/World Bank is playing too great a role in the distribution of financing for climate-related projects. They argued that the GEF does not have as much expertise in climate issues and solutions as the United Nations Environment Programme or the United Nations Development Programme. In light of this, the LDCs believe that the UNEP and UNDP should be responsible for making decisions about a greater proportion of loan funding and financing under the Climate Convention. On a more practical note, the students and I learned important logistical things like where to pick up the headsets so that we can follow along with the English translation of delegates speaking other languages, where to sit for the best view and sound, and that some minor photography is being tolerated by security. This early session was not crowded, so it served as a great practice run. Tomorrow, when the first real proposals will be debated, we expect the crowds to be larger, so it will be helpful to have a better idea of what’s going on. Stay tuned! This entry was posted in Adaptation, Behind the Scenes, Finance, In Our Own Words, LDC Group and tagged adaptation, Financing, GEF, LDC, UNDP, UNEP, World Bank. Bookmark the permalink.